Faults drawn on seismic or geologic sections are usually portrayed as single lines of even thickness. In detail, however, faults are rarely simple surfaces or zones of constant thickness. In fact, most faults are complex structures consisting of a number of structural elements that may be hard to predict. Because of the variations in expression along, as well as between, faults, it is not easy to come up with a simple and general description of a fault. 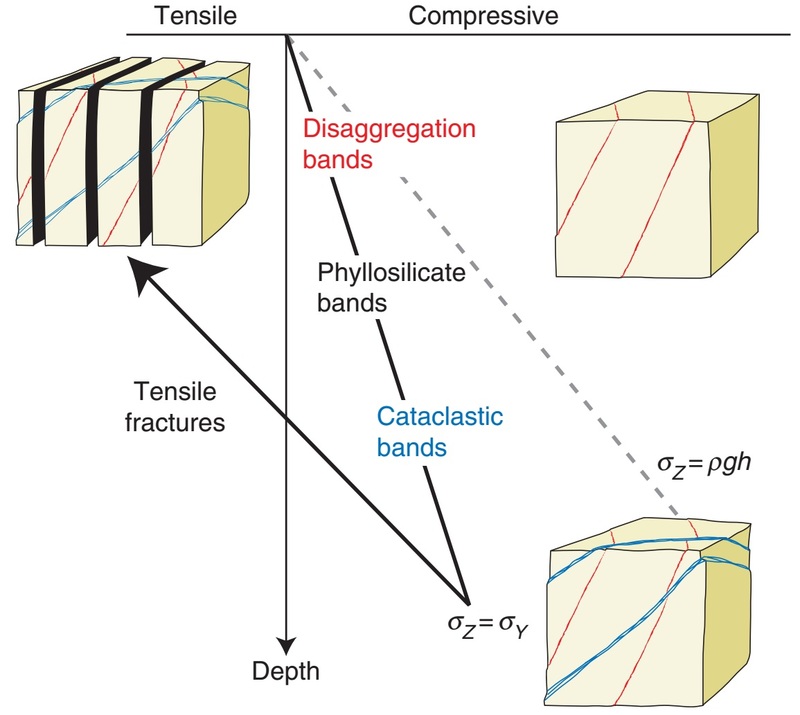 In most cases it makes sense to distinguish between the central fault core or slip surface and the surrounding volume of brittlely deformed wallrock known as the fault damage zone, as illustrated in Figure 8.10. The fault core can vary from a simple slip surface with a less than millimeter-thick cataclastic zone through a zone of several slip surfaces to an intensely sheared zone up to several meters wide where only remnants of the primary rock structures are preserved. In crystalline rocks, the fault core can consist of practically non-cohesive fault gouge, where clay minerals have formed at the expense of feldspar and other primary minerals. 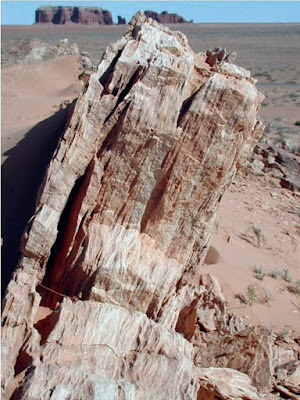 In other cases, hard and ﬂinty cataclasites constitute the fault core, particularly for faults formed in the lower part of the brittle upper crust. 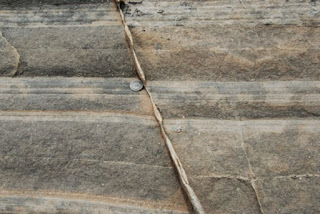 Various types of breccias, cohesive or non-cohesive, are also found in fault cores. In extreme cases, friction causes crystalline rocks to melt locally and temporarily, creating a glassy fault rock known as pseudotachylyte. 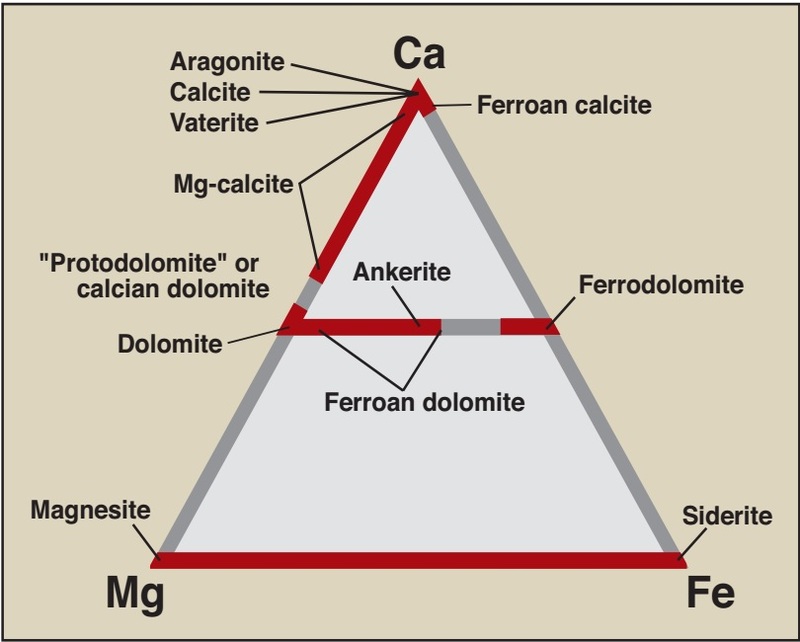 The classiﬁcation of fault rocks is shown in heading below. In soft, sedimentary rocks, fault cores typically consist of non-cohesive smeared-out layers. In some cases, soft layers such as clay and silt may be smeared out to a continuous membrane which, if continuous in three dimensions, may greatly reduce the ability of ﬂuids to cross the fault. In general, the thickness of the fault core shows a positive increase with fault throw, although variations are great even along a single fault within the same lithology. 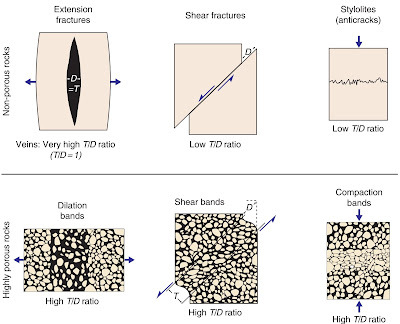 The damage zone is characterized by a density of brittle deformation structures that is higher than the background level. It envelops the fault core, which means that it is found in the tip zone as well as on each side of the core. 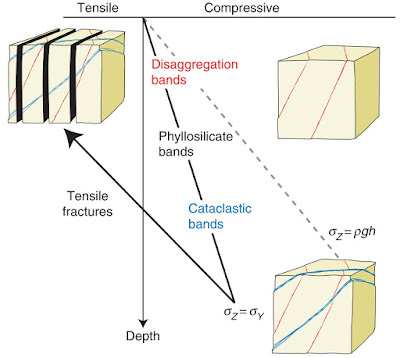 Structures that are found in the damage zone include deformation bands, shear fractures, tensile fractures and stylolites, and Figure below shows an example of how such small-scale structures (deformation bands) only occur close to the fault core, in this case deﬁning a footwall damage zone width of around 15 meters. 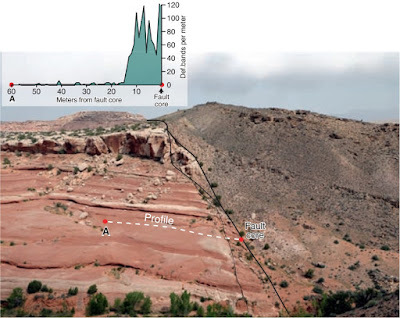 Damage zone in the footwall to a normal fault with 150–200 m throw. The footwall damage zone is characterized by a frequency diagram with data collected along the proﬁle line. 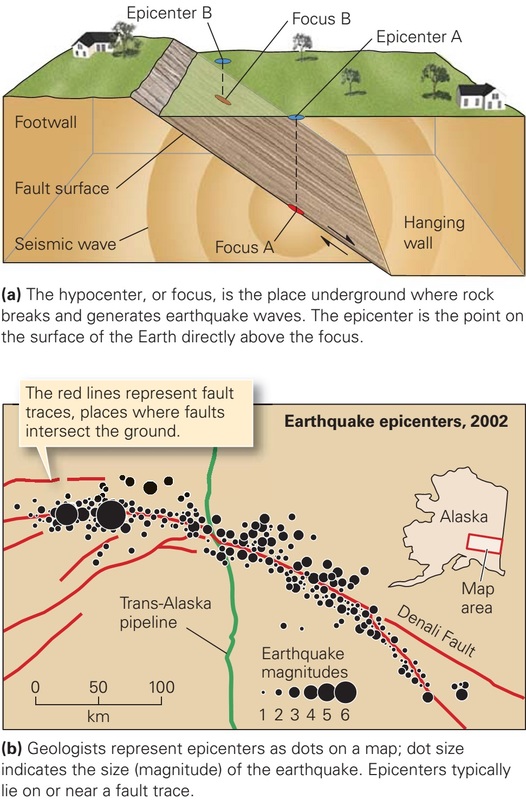 A fault lens is seen in the upper part of the fault. Entrada Sandstone near Moab, Utah. 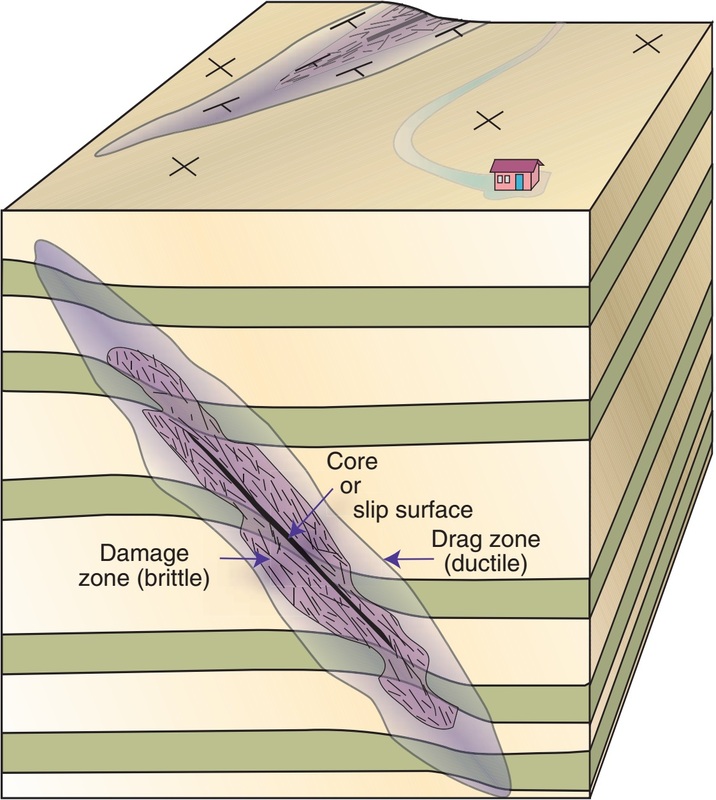 The width of the damage zone can vary from layer to layer, but, as with the fault core, there is a positive correlation between fault displacement and damage zone thickness (Figure below a). Logarithmic diagrams such as shown in Figure below are widely used in fault analysis, and straight lines in such diagrams indicate a constant relation between the two plotted parameters. 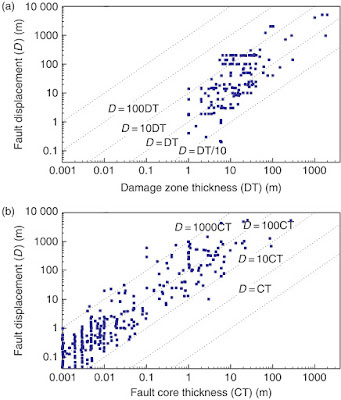 In particular, for data that plot along one of the straight lines in this ﬁgure, the ratio between fault displacement D and damage zone thickness DT is the same for any fault size, and the distance between adjacent lines in this ﬁgure represents one order of magnitude. 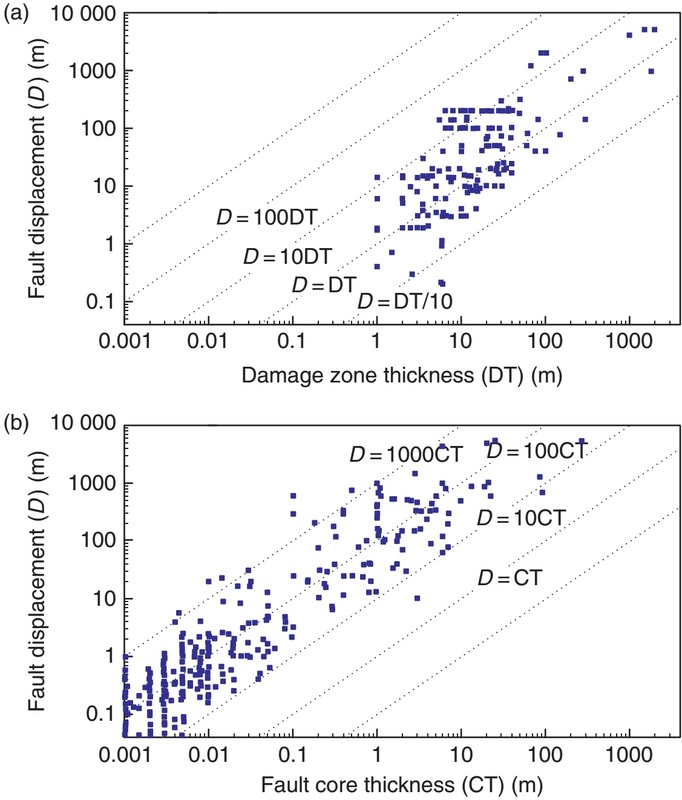 Much of the data in Figure below a plot around or above the line D=DT, meaning that the fault displacement is close to or somewhat larger than the damage zone thickness, at least for faults with displacements up to 100 meters. We could use this diagram to estimate throw from damage zone width or vice versa, but the large spread of data (over two orders of magnitude) gives a highly signiﬁcant uncertainty. A similar relationship exists between fault core thickness (CT) and fault displacement (Figure below b). This relationship is constrained by the straight lines D=1000CT and D-10CT, meaning that the fault core is statistically around 1/100 of the fault displacement for faults with displacements up to 100 meters. (a) Damage zone thickness (DT) (one side of the fault) plotted against displacement (D) for faults in siliciclastic sedimentary rocks. (b) Similar plot for fault core thickness (CT). Note logarithmic axes. Data from several sources. Layers are commonly deﬂected (folded) around faults, particularly in faulted sedimentary rocks. The classic term for this behavior is drag, which should be used as a purely descriptive or geometric term. The drag zone can be wider or narrower than the damage zone, and can be completely absent. 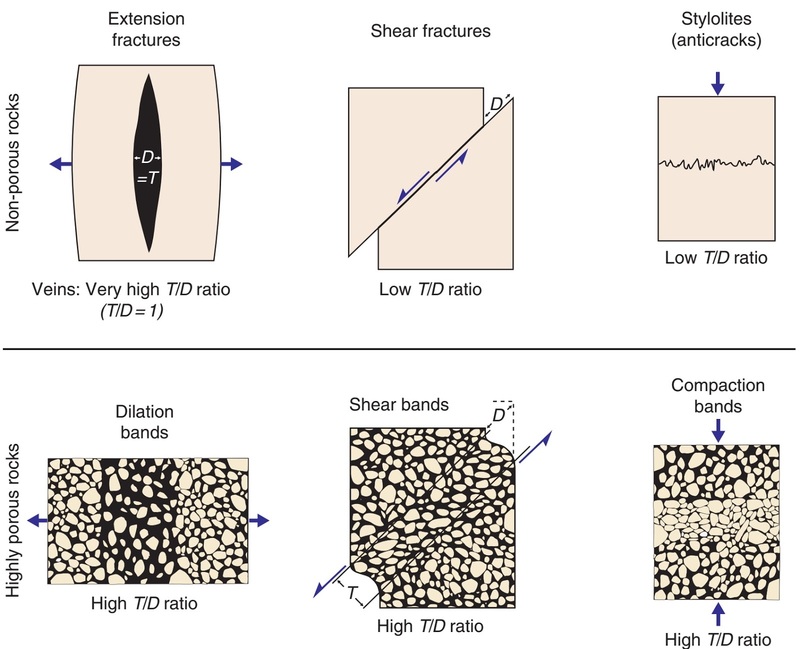 The distinction between the damage zone and the drag zone is that drag is an expression of ductile fault-related strain, while the damage zone is by deﬁnition restricted to brittle deformation. They are both part of the total strain zone associated with faults. In general, soft rocks develop more drag than stiff rocks. When fault movements alter the original rock sufﬁciently it is turned into a brittle fault rock. There are several types of fault rocks, depending on lithology, conﬁning pressure (depth), temperature, ﬂuid pressure, kinematics etc. at the time of faulting. It is useful to distinguish between different types of fault rocks, and to separate them from mylonitic rocks formed in the plastic regime. 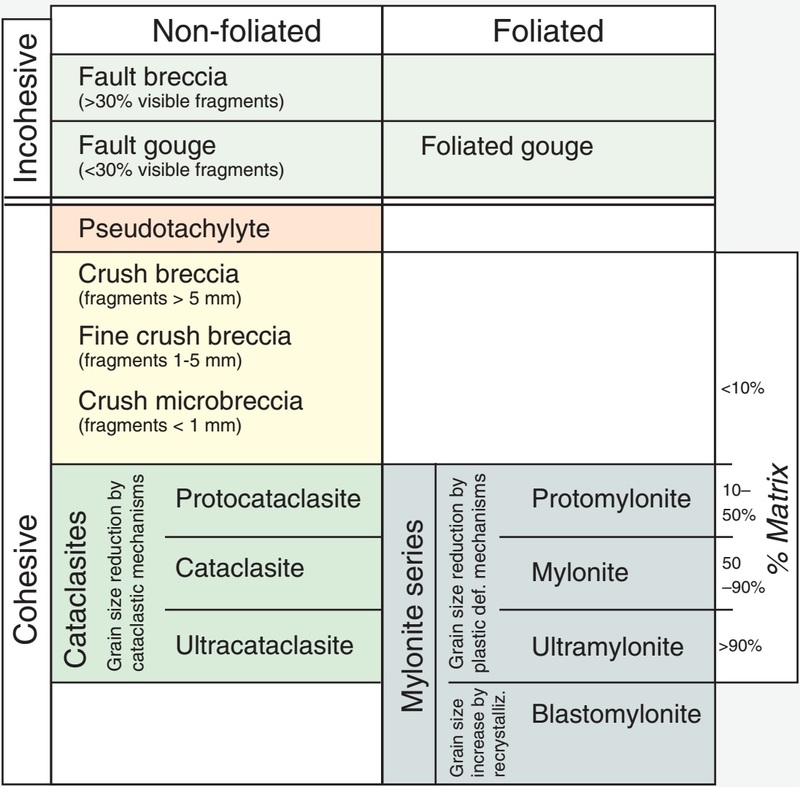 Sibson (1977) suggested a classiﬁcation based on his observation that brittle fault rocks are generally non-foliated, while mylonites are well foliated. He further made a distinction between cohesive and non-cohesive fault rocks. 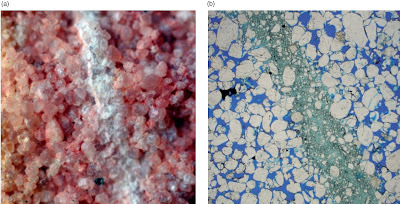 Further subclassiﬁcation was done based on the relative amounts of large clasts and ﬁne-grained matrix. 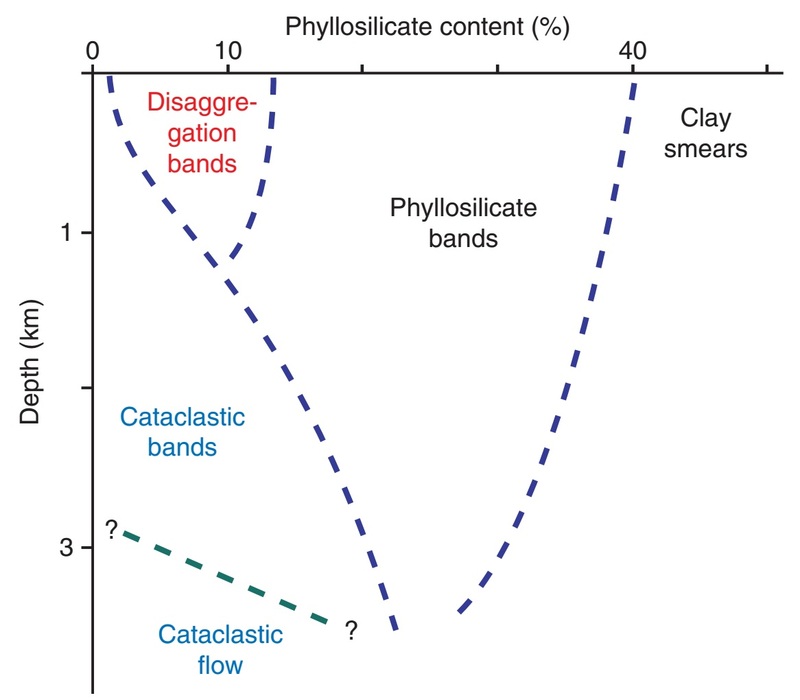 Sibson’s classiﬁcation is descriptive and works well if we also add that cataclastic fault rocks may show a foliation in some cases. Its relationship to microscopic deformation mechanism is also clear, since mylonites, which result from plastic deformation mechanisms, are clearly separated from cataclastic rocks in the lower part of the diagram. Fault breccia is an unconsolidated fault rock consisting of less than 30% matrix. If the matrix fragment ratio is higher, the rock is called a fault gouge. 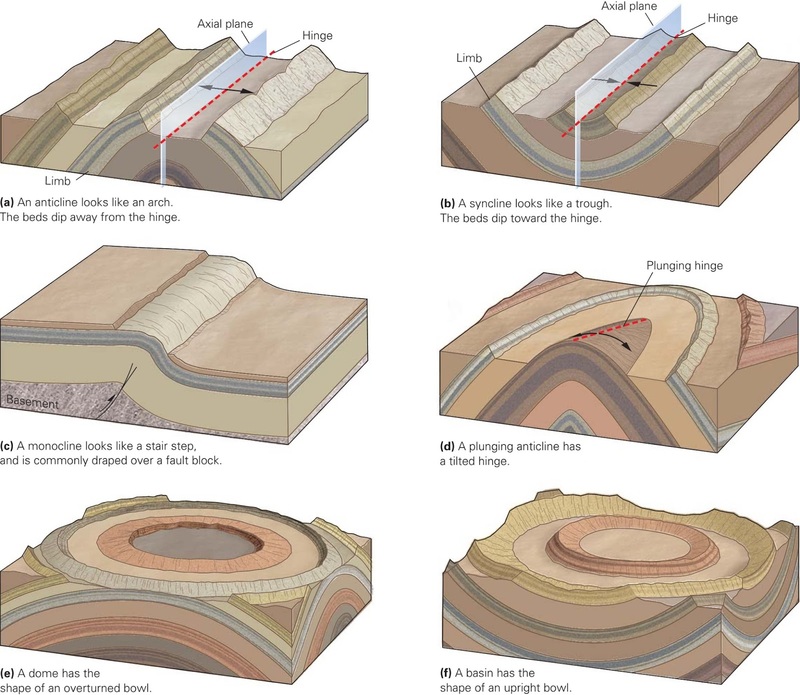 A fault gouge is thus a strongly ground down version of the original rock, but the term is sometimes also used for strongly reworked clay or shale in the core of faults in sedimentary sequences. These unconsolidated fault rocks form in the upper part of the brittle crust. They are conduits of ﬂuid ﬂow in non-porous rocks, but contribute to fault sealing in faulted porous rocks. Pseudotachylyte consists of dark glass or microcrystalline, dense material. It forms by localized melting of the wall rock during frictional sliding. Pseudotachylyte can show injection veins into the sidewall, chilled margins, inclusions of the host rock and glass structures. It typically occurs as mm- to cm-wide zones that make sharp boundaries with the host rock. Pseudotachylytes form in the upper part of the crust, but can form at large crustal depths in dry parts of the lower crust. Crush breccias are characterised by their large fragments. They all have less than 10% matrix and are cohesive and hard rocks. 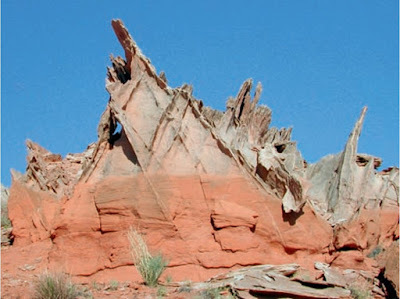 The fragments are glued together by cement (typically quartz or calcite) and/or by microfragments of mineral that have been crushed during faulting. 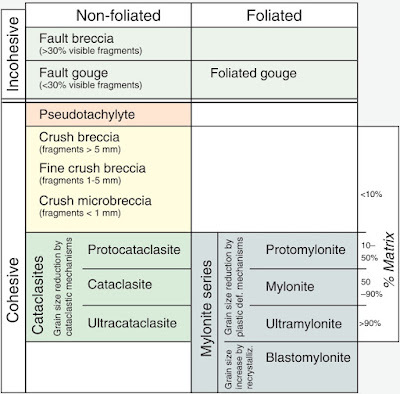 Cataclasites are distinguished from crush breccias by their lower fragment–matrix ratio. The matrix consists of crushed and ground-down microfragments that form a cohesive and often ﬂinty rock. It takes a certain temperature for the matrix to end up ﬂinty, and most cataclasites are thought to form at 5km depth or more. Mylonites, which are not really fault rocks although loosely referred to as such by Sibson, are subdivided based on the amount of large, original grains and recrystallised matrix. Mylonites are well foliated and commonly also lineated and show abundant evidence of plastic deformation mechanisms rather than frictional sliding and grain crushing. They form at greater depths and temperatures than cataclasites and other fault rocks; above 300 C for quartz-rich rocks. The end-member of the mylonite series, blastomylonite, is a mylonite that has recrystallized after the deformation has ceased (postkinematic recrystallization). 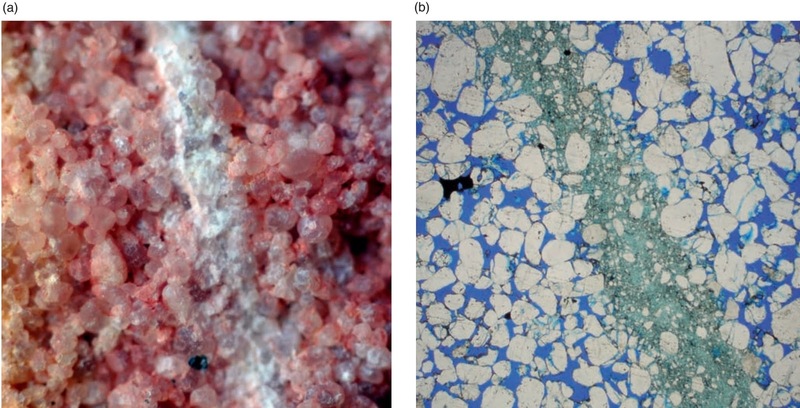 It therefore shows equant and strain-free grains of approximately equal size under the microscope, with the mylonitic foliation still preserved in hand samples.